Home > Knowledge Center > Can Artificial Grass Get Wet? As artificial grass grows in popularity, we are beginning to see it in more residential, commercial and municipal applications. 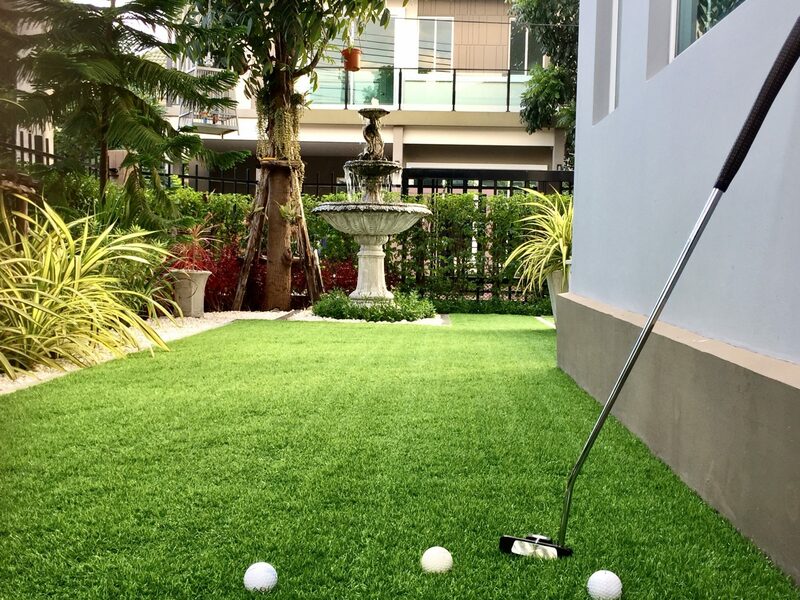 However, while we are seeing it more often and it is becoming a much more common landscaping choice, most folks are not that familiar with modern synthetic turf and still have lots of questions. For example, since we know that irrigation is not required and that it is a manufactured product, it is understandable that some people may be uncertain about whether or not artificial grass can get wet or if it is okay to install this type of ground cover in areas where it snows. Absolutely. While this low-water landscaping solution does not require irrigation, it definitely can get wet. In fact, most homeowners use water to clean their fake grass if it becomes dusty or in areas that are used as restrooms by pets. Synthetic turf is designed with a perforated backing that allows water to drain through the turf and into the sub-base, which is specifically crafted to allow proper drainage. Therefore, it is perfectly fine for your artificial grass to get wet. In fact, a manufactured lawn is actually better than natural grass in terms of how it performs and owner satisfaction after it gets wet from wayward sprinklers or rainfall. It can take days for your natural grass to dry out enough for your children or pets to play on it after a heavy rain. Plus, if anyone does cross your natural lawn during or after it rains, it is highly likely that they will end up tracking mud and wet grass blades into your house. This is not the case with synthetic turf. There is no mud in an artificial grass lawn and your children or pets can enjoy your lawn during or immediately after rain. As an added bonus, rain can clean your fake grass for you, which will save you the time it might have taken to spray it down with a garden hose to remove dust. Can Artificial Grass Withstand Snow? Yes, synthetic turf is perfectly fine to install in areas where it snows. In fact, many homeowners living in colder climates prefer manufactured lawns to natural grass because they do so well and look great throughout the winter. While natural grass will either turn brown and die back completely or get patchy, brown spots in areas with freezes and snow, fake grass looks green and lush throughout the winter. When possible, it is best to simply allow the snow to melt naturally on your lawn. The turf is manufactured with perforation to allow water to seep through the material, and the sub-base is crafted to allow proper drainage. If there is a heavy snowfall and you need to remove the snow from artificial grass walkways, dog runs, your lawn or other areas, you will want to remove the snow by hand. Additionally, you will want to use a plastic shovel – not metal – to minimize the potential for damaging the grass blades during snow removal. After a heavy snowfall that remains on the grass for an extended period of time, you may notice that your manufactured lawn looks a bit flattened. To encourage the blades to once again stand erect, you just need to fluff your grass a bit with a rake, broom or brush. There are specially designed turf rakes just for this purpose, or you can use a plastic rake or non-wire broom or brush to gently lift the blades. It is not recommended to use salt to melt snow or ice on synthetic grass. While the turf can withstand the application of salt, the residue can cause build-up that can impair proper drainage.